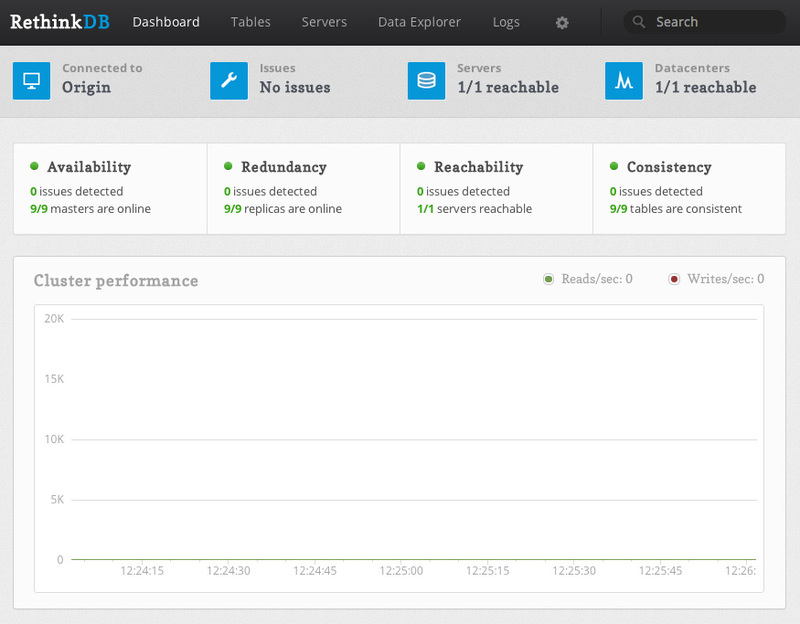 DigitalOcean, a great startup VPS provider, is a cheap means of trying out RethinkDB for yourself. The one issue is, they currently do not provide any easy way of securing clusters of RethinkDB instances. Unlike Amazon’s security groups, which allow you to restrict traffic between specific instances, every DigitalOcean VPS can talk to each other over the private network1. Essentially, this would allow any DigitalOcean VPS in the data center to attach itself to your RethinkDB cluster, which is less than ideal. Because of this, DigitalOcean is not a great host to run a cluster on if you’re looking to get up and running quickly. There are ways around this, such as running a VPN (especially a mesh VPN like tinc) or manually adding each RethinkDB’s IP address to your iptables rules, but this is a much more complicated setup than using another host that has proper security groups. However, this doesn’t mean that DigitalOcean is a bad host for your RethinkDB database– especially if you’re looking to try out the database or if you’re just running a single node (which is fine for many different applications). In this tutorial, we’ll go over how to properly setup a RethinkDB node and configure iptables to secure access to the database and web administration interface on DigitalOcean specifically, however this tutorial applies to any VPS or Dedicated Server provider. The first step you want to take is to sign up for DigitalOcean. If you sign up from this link, you will receive $10 in credit for free. This is enough to run a 512 MB droplet for two months, or a 1 GB RAM droplet for a single month2. After registering, log into your account and create a new droplet3 on the dashboard. Enter a hostname, choose an instance size4, select the region closest to you5 for the lowest latency, and choose an operating system. For now, “Ubuntu 13.10 x64” or “Ubuntu 13.04 x64” are good choices unless you have another preference. If you wish to use an SSH key for authentication (which is highly recommended), select which key you’d like preinstalled on your Droplet. After you’ve selected all of the options you’d like to use, click the large “Create Droplet” button at the bottom of the screen. Once your instance is launched, you’re taken to a screen containing your server’s IP address. Go ahead and SSH into it with either the root password emailed to you or with your SSH key if you’ve selected that option. You should be taken to the console for your freshly launched Ubuntu instance. To actually install RethinkDB, you’ll need to add the RethinkDB Personal Package Archive (PPA) with the command sudo add-apt-repository ppa:rethinkdb/ppa6. Next, update your apt sources with sudo apt-get update, and then install the RethinkDB package with sudo apt-get install rethinkdb. As of now, you could run the command rethinkdb, and RethinkDB would start up and create a data file in your current directory. The problem is, RethinkDB does not startup on boot by default and is not configured properly for long term use. Note that there are two commands above– if there is a line break inside of the first command, ensure you copy and paste (or type out) the whole thing. This will open up the “nano” editor, though you can substitute this with any other editor you have installed on your VPS. # - Give this file the extension .conf and put it in /etc/rethinkdb/instances.d in order to enable it. # - Uncomment an option to change its value. ## This option can be specified multiple times. There are a couple of important entries we need to look at. First of all, is the bind address. By default, RethinkDB will only bind on the local IP address 127.0.0.1. This means that nothing outside of the machine the RethinkDB server is running on can access the data, join the cluster, or see the web admin UI. This is useful for testing, but in a production environment where the database is running on a different physical server than the application code, we’ll need to change this. If you’ve launched an instance in a data center than supports private networking, you can change the bind option to your private IP address7 to start with. For example, if my private IP address is 10.128.2.18, you could use that value for the bind option. Also, make sure you remove the leading hash “#” symbol. This will uncomment the line and make the configuration active. If you want your database to be accessible to the public Internet, you may use your public IP address. Note that there are security ramifications of exposing your RethinkDB instance to the Internet, though we’ll address them a little later. If you wish to bind to all IP addresses– including public IP addresses–you can use 0.0.0.0. The driver and cluster port options generally should not be modified unless you have a reason to do so. Modifying the ports just so that someone may not “guess” which ports you’re using for the RethinkDB instance is not secure– always assume that someone will find which ports you’ve configured, and secure your machine appropriately. This option configures which port the HTTP administration UI will be accessible on. As with the driver-port and cluster-port, you can change this if the port is already in use by another service. However, note that the admin UI is not secured in any way. Anyone with access to the admin panel can edit and delete machines from your cluster, and create, edit, and delete database tables and records. However, the admin UI will only be available on the bind address you’ve configured, so if you’ve left your bind address as 127.0.0.1, you will only be able to access the admin UI directly from the machine running RethinkDB. The join address will not be used in this lesson, though this option configures which hostname or IP address and port your RethinkDB instance will attempt to join to form a cluster. This is assuming that you have not changed the default cluster communication port of 29015. Simply modify the above command to read the same as the “cluster-port” configuration entry if necessary. To access the web administration UI through an SSH tunnel, you can use the following set of commands. First, we must make the administration UI accessible on localhost. Because we dropped all traffic to the port 8080, we want to ensure that traffic from the local machine is allowed to port 8080. The above command does one thing– it inserts a rule, before the DROP everything rule, to always accept traffic to port 8080 from the source 127.0.0.1— the local machine. This will allow us to tunnel into the machine and access the web interface. Next, we need to actually setup the tunnel on your local machine. This should not be typed into your VPS console, but in a separate terminal window on your laptop or desktop. Replace the $LOCALPORT variable with a free port on your local machine, $HTTPPORT with the port of the administration interface, and $IPADDRESS with your VPS IP address. Additionally, if you SSH into your VPS with another username (e.g. root), you may append “[email protected]” before the IP address, replacing $USERNAME with the username you use to authenticate. Once you’ve run the above commands, then you should be able to visit localhost:$LOCALPORT in your local web browser and see the RethinkDB web interface. Because using a reverse proxy involves setting up Apache, Nginx, or some other software on your VPS, it is better to refer you to the official RethinkDB documentation on the subject. The setup steps aren’t long, but out of the scope of this tutorial. If you setup a reverse proxy, make sure you still allow local traffic to the web administration port. However, I would like to reiterate the insecurity of this method– anyone with your external IP address, including those on your WiFi or home network, will have unrestricted access to your database. Now that you’ve allowed yourself access to the web administration UI, you also need to ensure that the client drivers and your application can access the client port properly, and that the access is secured with an authentication key. First and foremost, you should set an authentication key for your database. This will require all client driver connections to present this key to your RethinkDB instance to authenticate, and allows an additional level of security. This will bring you into the command line administration interface for your RethinkDB instance. You can run a single command, set auth $AUTHKEY, replacing $AUTHKEY with your authentication key. After you’re done, you can type exit to leave the administration interface, or you can take a look at the RethinkDB documentation to see other commands you can run. If you recall, at this point, the client port (by default, 28105) is still accessible from the public Internet or on whatever interfaces you’ve bound RethinkDB to. You can increase security to your database by blocking access (or selectively allowing access) to the client port using iptables and commands similar to those listed earlier in the tutorial. 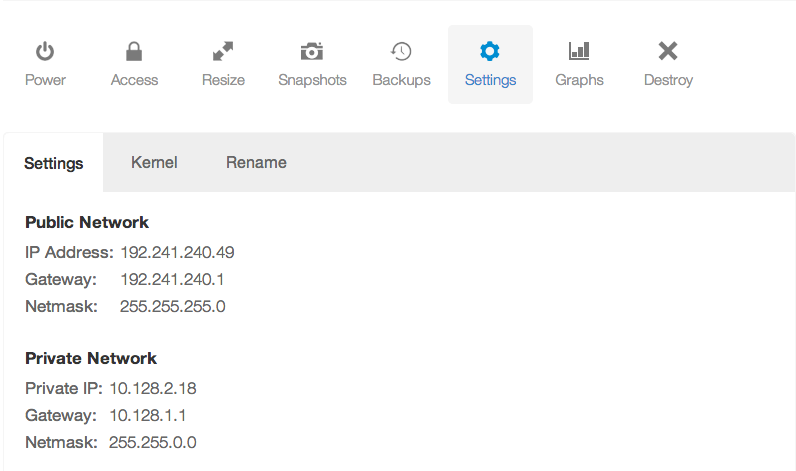 Now that you’ve setup RethinkDB and secured it using iptables, you can access the administration UI and connect to your instance using a client driver with an authentication key. Though we’ve taken basic security measures to run RethinkDB on DigitalOcean, it’s still recommended to take additional precautions. For example, you may wish to either use a mesh VPN such as tinc to encrypt the database traffic between your clustered instances, if you choose to expand your cluster in the future. It’s also worth reading over the fantastic RethinkDB official documentation for additional instruction on configuring your instance or cluster, or on how to use the administration interface or the ReQL query language8.